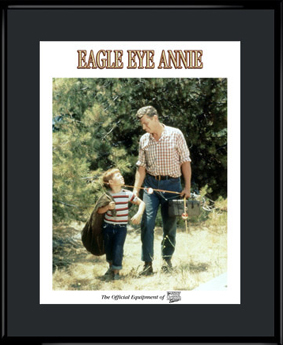 This 11×14 lithograph features Andy and Opie walking along carrying the prized “Eagle Eye Annie” fishing pole. 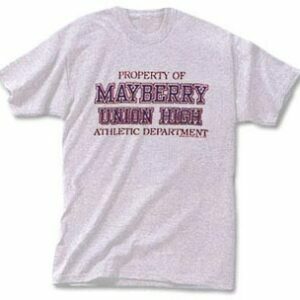 Each lithograph comes matted and framed with certificate of authenticity. 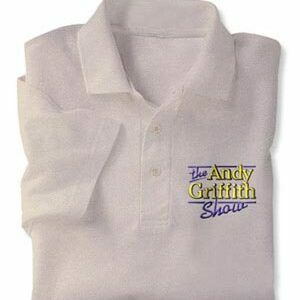 The Andy Griffith Show is an American sitcom first televised by CBS between October 3, 1960 and April 1, 1968. 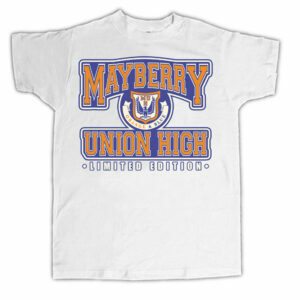 Andy Griffith portrays a widowed sheriff in a fictional small community of Mayberry, North Carolina. 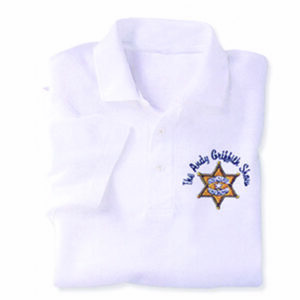 His life is complicated by an inept but well-meaning deputy, Barney Fife (Don Knotts), an elderly aunt and housekeeper, Aunt Bee (Frances Bavier), and a young son, Opie (Ron Howard). Local ne’er-do-wells, bumbling pals, and temperamental girlfriends further complicate his life. This collectible 11×14 lithograph features Jim Nabors as Gomer Pyle Comes matted and framed with certificate of authenticity. January 14. 1963 (third season, episode 79) was the day Gomer Pyle made his debut on the Andy Griffith Show as the lovable, but dimwitted mechanic at Wally’s Service Station. 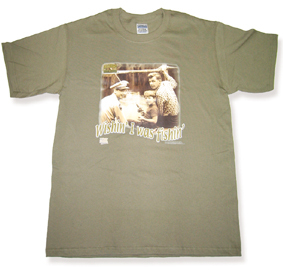 Gomer’s skills as a mechanic may not have been popular with Sheriff Taylor and Deputy Fife, but his popularity with America was immediate and his catch phrases caught on fast. Gomer Pyle is best known for his trademark phrases “Shazam”, “Gaaw-leee”, and “Citizen’s Arrest, Citizen’s Arrest.” After only one season, Gomer’s overwhelming appeal led him to his own show “Gomer Pyle, U.S.M.C., which aired for 5 seasons at the top of the Nielsen ratings. License Plate Holder – I’d Rather Be Watching . 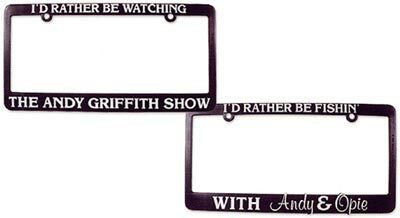 . .
Add some oomp to your automobile with this “I’d Rather be Watching the Andy Griffith Show” license plate holder. 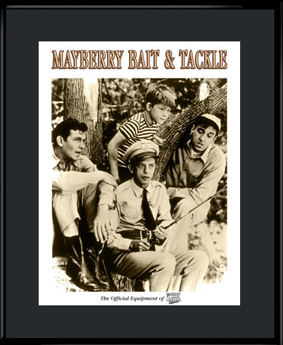 This 11×14 lithograph features the Men of Mayberry at the fishing hole. 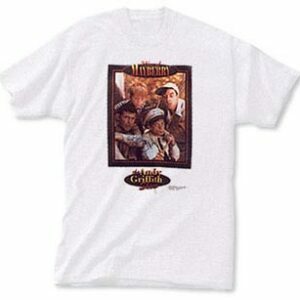 Each lithograph comes matted and framed with certificate of authenticity. 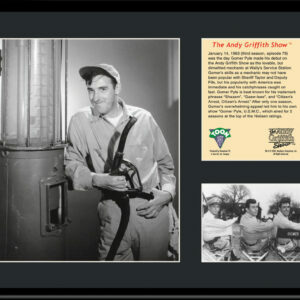 Send your friends a flash from the past with these Andy Griffith vintage postcards. 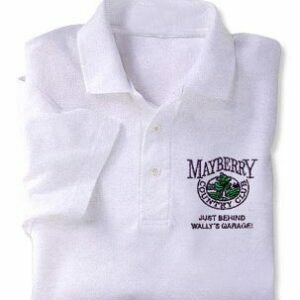 Each image caputures the personalities that made Mayberry everyone’s favorite hometown! Package of 5 assorted cards.